Congratulations to the high school band and the high school choir who participated in large group contest over the weekend! The band performed on Friday evening at Sylvania Southview HS. Selections included Washington Post, Joy, and Rhythm Stand. The choir performed Saturday afternoon at Perrysburg HS. Choir selections included A Festive Call to Freedom, Arirang, and Who Will Be a Witness?. Congratulations to the high school band, choir, and jazz band students who participated in the 49th annual Christmas Cabaret on Saturday. Alumni members also performed as part of the Hallelujah Chorus finale. Mark your calendars for next year, when we’ll celebrate “50 Years of Christmas Cabaret” on Saturday, December, 14, 2019. 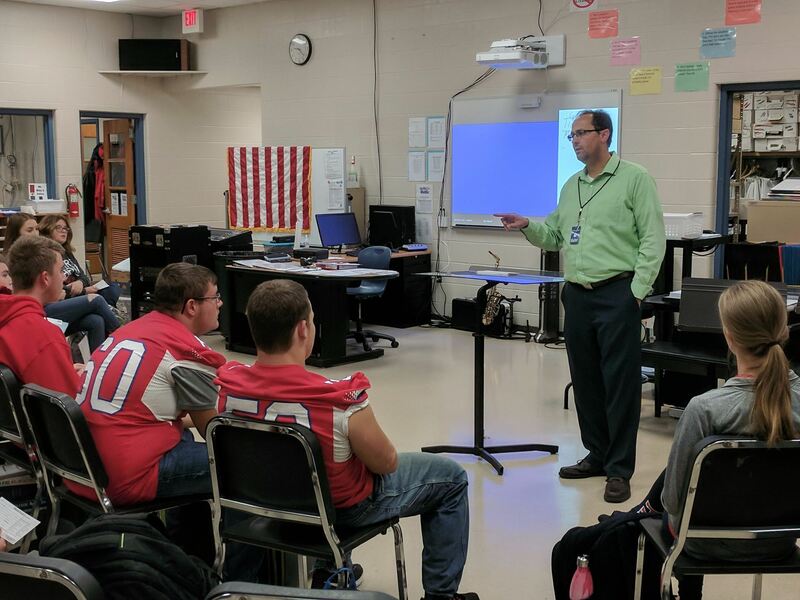 The Patrick Henry High School Choir performed for Defiance College Music Director, Dr. James Watson during class on October 13. 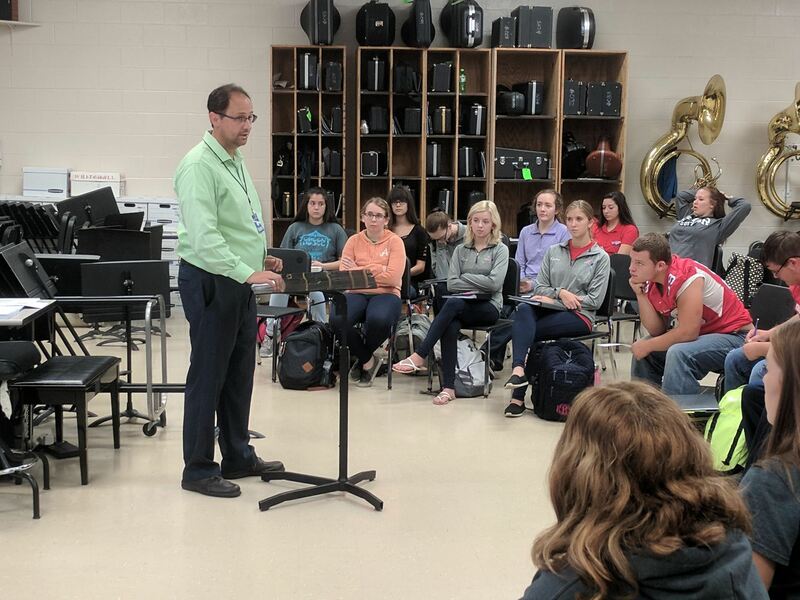 The students received valuable feedback to help with their upcoming performance at the Fall Choir Concert on Monday, October 16 at 7:00PM in the PHHS Gym. The Patrick Henry Patriot Marching band will have their marching band camp this week from 8:30 to 3:30 daily. Please view the marching band camp schedule for details on what to bring, spirit days, and other information. The group picture on Day 2 (Tuesday) will be a simple group picture for the football program. We will do it when the golfers are there. Individual and group pictures with the professional photographer will be scheduled another time when all students are present. Also, the marching band calendar has been updated. You can always view the most current marching band calendar on the calendar page of this website. High school band students can now access the marching band calendar on calendar section of the Patrick Henry Music Website. Simple click on “Calendar” on the navigation bar and then click the “Marching Band Calendar” link to download the PDF. Bookmark the calendar page for quick access to the calendar and updates. What are the benefits of learning to play and instrument? What if I want to play a different instrument? What do I need to look for when searching for an instrument to buy? What other supplies do I need to get? What can I do to get ready for band next semester? Next semester, fifth grade students can choose to be in band or choir or both (if they are willing to give up one of their study hall periods). Anyone can do band — I have experience working with students in band who are also actively involved in football, basketball, drama, scholars bowl, gymnastics, boy scouts, church youth — you name it. 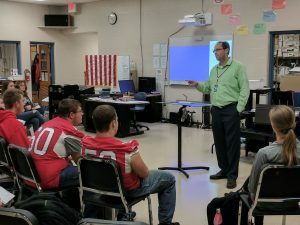 Band (and music) can be an important ingredient in providing students with a well-rounded education. We are currently in the process of testing students on instruments to find the best match for them. 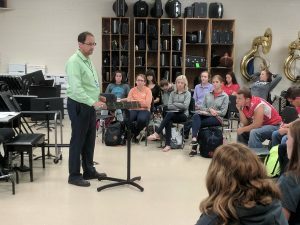 This is an important step in the process of joining band where we try each student out on their top two or three choices to see what instrument is the best fit. We take many factors into consideration in this process such as student interests, physical characteristics, and coordination (for percussionists). Our goal is to find the instrument that your student would be most successful on. I am really looking forward to working with you in band. Please email or call me if you have any questions.